The kidney stone model is a helpful tool to inform patients about kidney stones (nephrolithiasis) and urinary stones (urolithiasis). Shown in the kidney stone model is an opened right kidney in natural size. The renal calices, the renal pelvis and the ureter are opened as well on the anatomy model so that concretions or stones can be identified in the following typical positions within the kidney: renal pyramids, origin of the upper calix group, renal cortex, connecting tubule of the lower calix group, causing congestion of the minor calices (partially closed, partially opened) in the kidney. 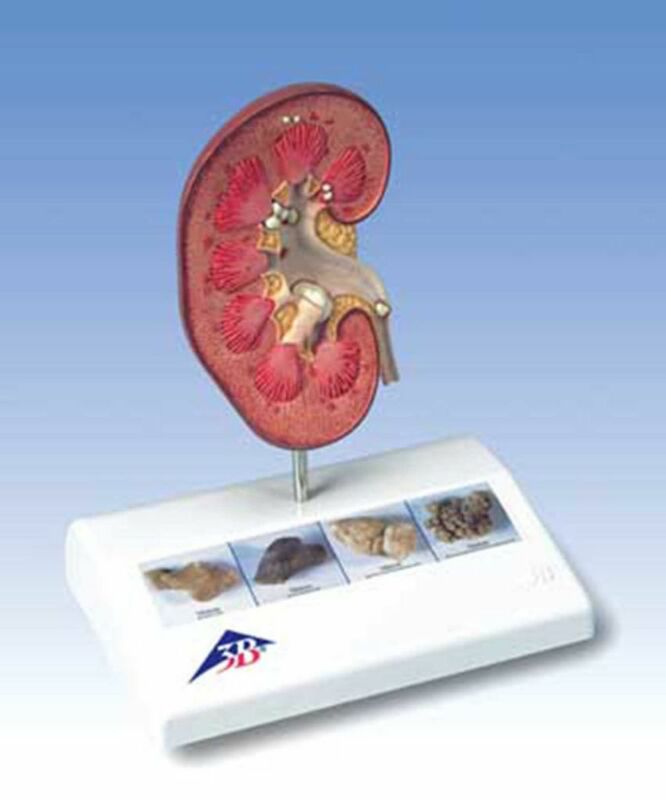 Four original color pictures on the base of the kidney stone model show various kidney stones.